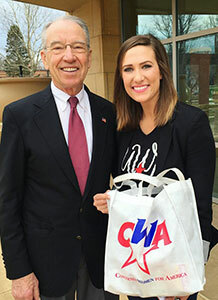 Des Moines, IA – Concerned Women for America (CWA) of Iowa, the state chapter of CWA, the largest public policy organization for women in the country, is proud to be joining Iowa Right to Life and Susan B. Anthony List later today to present thousands of petitions signed by our members, thanking Sen. Charles Grassley for his courageous stance on how to fill the current vacancy at the U.S. Supreme Court. Sen. Grassley is living up to that solemn oath to “support and defend the Constitution” when he stands against President Obama’s haste to confirm a third Supreme Court justice. He acts in the best interest of Iowans and of all the people when he gives us a voice on this important issue as we go to the polls this next election. All the issues we care about are in the balance. From religious liberty to the sanctity of life to marriage to the right to keep and bear arms; we must stand for the Constitution, or we will have none. Truth is we wouldn’t be in this position if we didn’t have a Supreme Court continually going beyond the law to force its policy preferences on us through judicial fiat and a Chief Executive who insists on ignoring constitutional limits through his abuse of executive power. Sen. Grassley and the Senate are wise to push back on this clear violation of the fundamental principles of the separation of powers. That structure – that separation— is what guards our liberties. It was the Founder’s mechanism to fight the tyrannous rule from which they sought independence. That is the essence of the fight Sen. Grassley is engaged in today. And the thousands of members of Concerned Women for America are proud to stand with him. For an interview with Tamara Scott or Penny Nance contact Janae Stracke at [email protected] or 712-269-1724.